The year was around 1985. The scene was the Upper West Side in New York City. Specifically it was inside Leo's Barber shop on 73rd and Amsterdam. About 11 a.m. on a weekday. I was inside the shop and Leo was cutting my hair. His shop was unusually empty. He depended on a steady flow of customers to pay the bills. He was originally from Italy. I was the only one inside with him on a normal workday-- that seemed odd. I asked him why. He told me that Mr Woody Allen had hired the shop from midday and that I was the last customer of the day. Seemed that Woody had hired the shop for a previous movie he made, and that he and Leo had 'a relationship' of sorts. I did note a photo of Woody on the wall behind me. And if Woody were going to take the whole place, I wondered what movie it might be. Leo didn't know. So I let it go. He was busy anyway, discussing so many things with his offsider. Leo finished my haircut and he took the hair-capturing cape off me. I arose from the barber chair. And Woody looked at me, or rather my shirt. He looked away. Then he did a double-take, looking back at the shirt. And that's when I should have said something. But I didn't. I'm sorry to this day that I didn't. Regrets, I have a few. I left and didn't think about this episode particularly again for months. Then the next Woody Allen movie came out entitled, "Hannah and her sisters." (1986) It was a typical Allen film with a great cast (Mia Farrow, Dianne Weist, Julia Louis-Dreyfuss, Michael Caine, Barbara Hershey, Richard Jenkins, Carrie Fisher...) and the problems of life and the meaning of life. The Allen character in the movie is (mis)diagnosed with a brain tumor and he begins seriously even investigating religion and spirituality. He is, of course, a Jewish man in the role he plays, and his search for meaning actually takes him to the Catholic church and he seeks to convert. 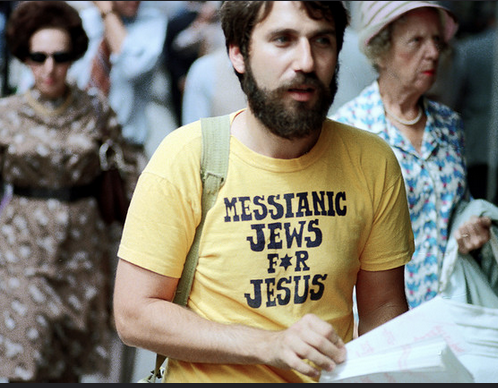 The scenes that follow are comic, real, disclosing and helpful for anyone who wants to know what Jewish people are thinking in this consideration of conversion. After Woody meets with a priest, we see Woody on the Upper West Side. He goes inside a bookshop and buys some items. 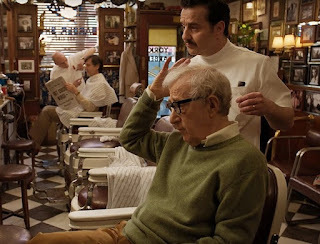 That bookshop was actually Leo's barbershop! The production crew changed things around and only used the front of the shop. Perhaps the inside shots were on the cutting room floor. I never knew. So the Woody character named Mickey, returns to his home and unpacks the conversion ware. What is inside the brown paper bag? What did Mickey buy at the Catholic bookshop? A Bible, of course. And a crucifix (The Catholic version with Jesus still affixed to the cross). A loaf of white bread. A jar of mayonnaise. No wonder Woody did a double-take on that barbershop day. His film character Mickey was going to convert to Jesus and here I was inside the shop where it would happen wearing a shirt .... well, you get it. It's not too late for the real Woody Allen to write me. I promise not to be shy and avoid his email. I promise to answer his questions, if they persist or linger at all. And I promise to answer yours as well. Like why the white bread and mayonnaise? Like why search for meaning and give up before you find it? Ask, you just might get an answer that works. A wonderful story and it encourages all of us to use every opportunity that the Lord gives us. I have also a few regrets that way but it has given me more boldness afterwards.